These bits and accessories for drill/drivers (left) will handle just about any fasteners. They are: (A) pliillips-head driver; (B) slot-ted-head driver; (C) magnetic tip holder; (D) hooded slotted-head driver; (E) socket driver; (F) hex driver; (G) finish nail spinner. Compressed-air-powered fasteners can dramatically decrease the amount r>f Lime you spend on a project- Many tools will fire fasteners as fast as you can pull the trigger. Most air nailers require a Vi to ] hp compressor with tank capacity of at least 3 gallons of air. Smaller air nailers and staplers usually run on 2 to 5 cubic feet per minute (cfm) or air volume at a pressure of 70 to 90 pounds per square; inch (psi). Larger framing nailers can require as much as 9 cfm and 100 to 120 psi. If you already own a compressor, check to make sure it's able to drive new air tools before purchasing them. When working with air-powered iasteners, it is essential to wear approved safety goggles and ear protection. Familiarize yourself with the operation of the tool before beginning work. A device that can send a nail deep into a 2 x 4 can do a great deal of harm to the human body. Note: Recently, a similar tool to air nailers, the cordless power nailer, has become available for home use or for rental fSee description below). Pneumatic staplers: Air-powered staplers can drive crown-style staples from Vi to V2 in. wide, and up to 2 in. long. Smaller staplers are useful for installing carpeting, roofing felt, floor undertayment and insulation. Larger capacity staplers can attach fence boards, strip flooring and even roof decking (check with your local building codes first). 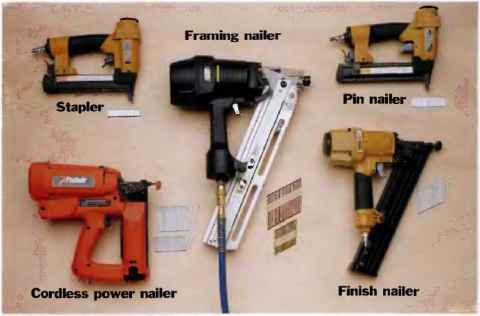 Framing nailers: The "big boy" of air-powered fasteners, these powerful, high-capacity tools will drive nails up to 3l/i in. long for all types of frame construction. The magazine can hold upwards of! 00 nails. Pin nailers: Drive brads up to IV4 in. long. Used to attach trim, carpet strips and moldings. This lightweight tool allows you to nail one-handed, a real help when aligning trim molding pieces. 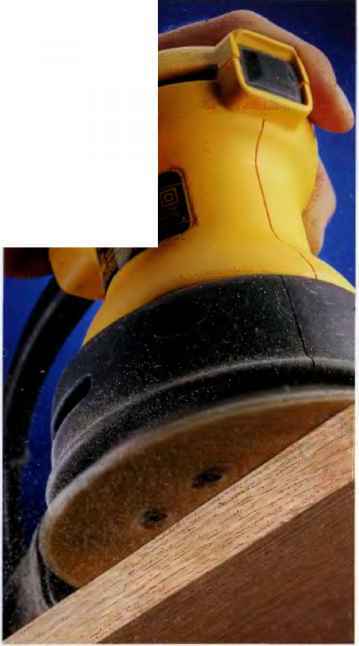 Finish nailer: Drives finish nails from :iA to 2 in. long. 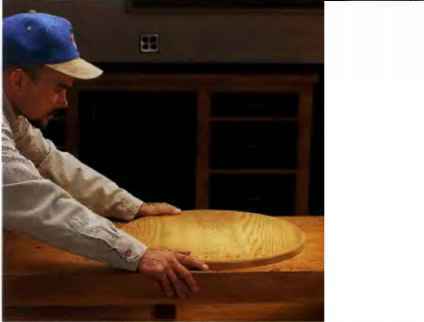 Useful for installing siding, flooring, door and window casing and most types of finish carpentry. Cordless power nailer: Relies on battery power and disposable fuel cells to power-drive nails. Also called impulse nailers. Require special fasteners, generally 16 gauge, from 1 V'2 to 3Y4 in. long, depending on the model. Each fuel cell will drive from 1200 t.o 2500 nails, depending on length, and a single battery charge will drive up to 4000 nails. If you do any amount of taping wall board seams, your shop or garage is likely cluttered with the leftover 5-gallon buckets used to package premised joint compound. They seem so useful, it's hard for most, of us t.o throw them away. Here's one: good way to put these leftover buckets to use: make them into hardware/fastener organizers. 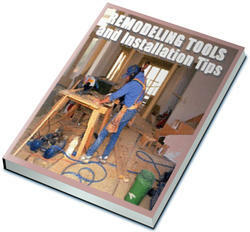 Use a jig saw with an edge guide to trim off the bottom 3 in. or so of several buckets, then cut pieces of scrap plywood so they're 2l/i in. wide and the same length as the inside diameter oft.be bucket. Fasten the strips to the buckets by driving wallboard screws up through the bucket bottom. To divide the bucket bottom into quadrants, simply add shorter scrap strips. Because the buckets are wider at. 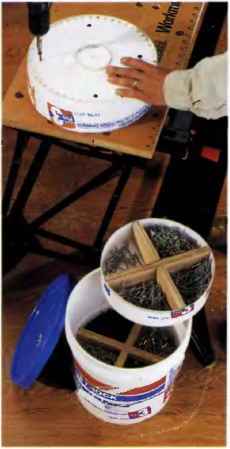 the top than the bottom, several bucket bottoms can be stacked inside one bucket, creating a totable hardware store.